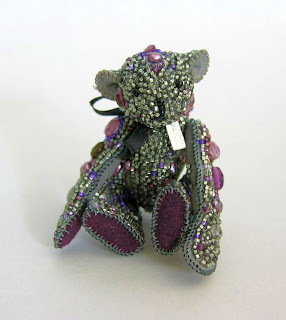 to view my beaded miniature bears and other animals. 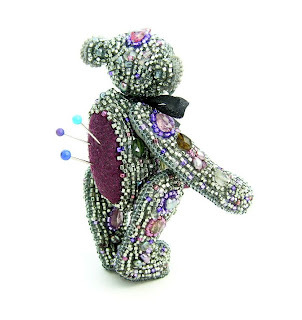 My bead embroidered bear pincushion is 2 3/4 inches high. He is fully jointed. He is made with size 15 seed beads, pearls, and semi-precious stones. The paw pads, foot paws, and ears are made with Ultra Suede and stitched with size 18 seed beads. I named the bear "Ouch! My Back Hurts" because of the pins in his back. 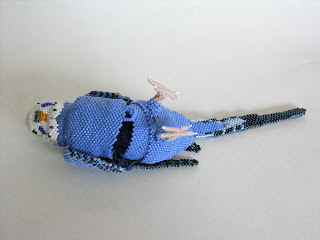 I started my blue beaded parakeet when I got my bird, Frankie. That was four years ago. I am glad to have finally finished it. The parakeet is almost life size and looks just like Frankie. The beaded parakeet opens in the middle. It is hollow inside. 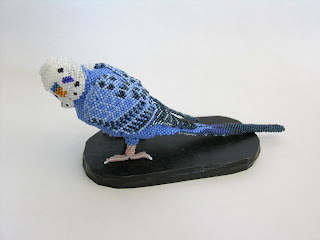 The parakeet is worked in peyote stitch. I have updated my web site with more pictures of my latest pieces. wow! I'm impressed..I'm just an art quilter wanna be beader! Your pieces are amazing. I'm off to look at your web site next. Wow, very nice. I love this bird. .....Es todo alucinante, los acericos o alfileteros me encantan y el loro es precioso, parece de verdad...tienes unas manos maravillosas.Felicidades.